One of my favourite hairstyles to go for is a big messy bun, it saves me from putting heat on the majority of my hair and it takes under 5 minutes. Up until recently I always found them a little bit of a faff to get right but on a late night peruse of Pinterest I saw another way that has made things 100x more simple. I've been doing this a morning when I've been going to the gym too and it has good staying power too which is what we all want, nobody likes a sad bun. 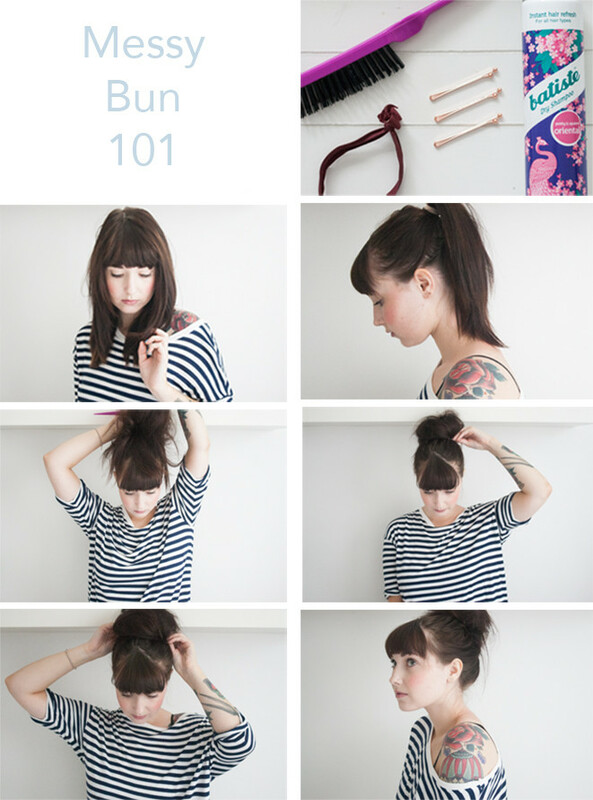 The tools you need are: a back combing brush, bobby pins, dry shampoo (to add texture) and a hair tie. After spritzing some Batiste through my hair I then give it a quick brush and I then straighten my fringe to style it. Tie your hair up into a pony tail, I like to make mine a little messy. Then back comb the pony tail to add a lot of texture. Wrap the hair around to form a bun shape, my hair always looks like candy floss at this point. Then bobby pin the hair into place so it is nice and secure and just play around with till you have your desired shape. Generally I just leave it there but you could spray some hairspray to keep it really in place. Are you a fan of a messy bun? This months gold sponsor is Vivi who runs the blog the Dainty Hummingbird, this months bronze sponsors are Fox & Star and Blueberry Segments, you can advertise with me here.